Think for a moment of the New Forest, and what comes to mind? Chances are that for many people it will be a New Forest Pony, particularly the spring and summer-born foals. 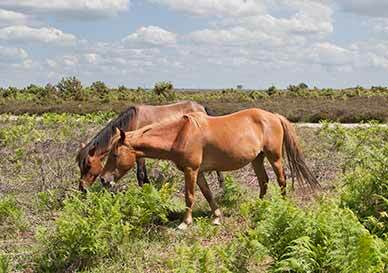 Whether feeding by the roadside, up to their hocks in a bog or drinking from a crystal clear stream, New Forest Ponies are an ever-popular sight with young and old alike. Hardy, sure-footed, enterprising and adaptable, the New Forest pony must exhibit all these characteristics, and more, to survive year-round in what can be a relatively harsh environment. Summer heat, winter cold, driving rains; all are the lot of the New Forest pony. Other pony breeds are also put out on the New Forest, but the local breed, the New Forest pony, is most characteristic of the area. All the ponies are free-ranging, although few stray far from their own favourite area, or haunt. 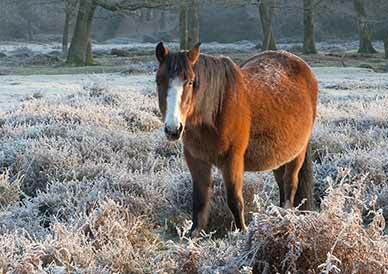 Exact location often depends on the time of year and weather conditions – winter, for example, will often find New Forest ponies deep in the woods, sheltering from the wind and cold, whilst at other times of year, they are more likely to be out in the open. Small groups of New Forest ponies are most often seen - mum and foal quite close together, with others, maybe, nearby. But on warm, sunny, summer days, quite large gatherings often occur, usually in favourite spots known as ‘shades’. The name, though, is something of a contradiction, for shades are often out in the open, sometimes in places exposed to cooling air currents, but more importantly, in places where flies are relatively absent. Traditional use by generations of New Forest ponies has left a number of ‘shade’ place names, some of which are marked on Ordnance Survey maps - Withycombe Shade, a short distance north of Beaulieu Road station, and Latchmore Shade, near Frogham, are good examples. Food in the large quantities required is for much of the year not easy to find, and so New Forest ponies have to spend around 80% of their time foraging. Diet is varied, and depends largely on the time of year. Grasses, when available, are taken, but gorse, holly and other tree leaves, woody material, heather, moss and bracken are also eaten. In fact, so intensely do New Forest ponies and other stock animals feed, that areas of grassland are almost always close-cropped; young holly trees take on the oddest, often conical, shapes; whilst older holly trees often exhibit a browse line, a horizontal skirt at the height reached by the animals, below which no branches grow. With good reason, then, New Forest ponies and other stock animals have been called the architects of the Forest scene, for without grazing pressure this unique landscape would be lost - Scots pine and birch would rapidly invade the heathlands, whilst the open, pasture woods would become overgrown with dense, under-storey vegetation. Many of the New Forest ponies, though, have learnt that the presence of people can often mean access to a free lunch, and hang around the roadsides and car parks trying to beg sandwiches and picnic leftovers. But feeding them is never a good idea - it just encourages further begging, maybe from people not quite so willing to indulge the ponies’ appetites. And whilst most New Forest ponies are fairly placid creatures, some can occasionally be aggressive and unpredictable, particularly when with small foals and when stallions are about - a small number of registered pure-bred stallions are usually turned out in mid- to late spring for around one month. Voracious feeding habits have, at times, also been the cause of other controversy. Allowed into the woodland inclosures from the late 1960s, New Forest ponies and other stock animals proceeded to remove brambles and much of the other ride-side vegetation that previously had supported large numbers of butterflies and moths. The consequences were predictable – butterfly and moth populations declined alarmingly, so-much-so that from the mid-1980s, the stock have been progressively ejected from many inclosures, but quickly return if gates are accidentally left open. If you need to report a sick, injured or distressed pony, cow, donkey, pig or sheep, then you should call the Verderers' Office on 023 8028 2052 during office hours (Mon-Fri 9am-5pm). Outside of these hours, call the Forestry Commission on 023 8028 3141 (24 hrs). September 2016 - free wallet-sized cards containing these details can be picked up from Lyndhurst Community Centre and other locations around the area, along with free 'I go slow for ponies' car stickers.